A record 500 foot buffet! 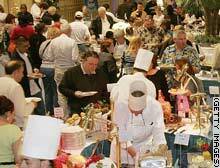 In Vegas, the city of excess, they have assembled a collection of forty soups, 100 salads and 150 desserts, all laid out on an array of tables totaling more than 500 feet long to qualify for a Guinness record for the World’s Largest Buffet. In order to qualify for a record, Las Vegas Hilton Executive Chef George Bargisen had to assemble at least 500 unique offerings. He succeeded; with 510 different dishes it was quite the spread for Guinness officials to sample. Spending 24 hours straight organizing the buffet bonanza, dishes from over a dozen ethnic cuisines were showcased. A sampling of foods included: salmon Wellington, fried alligator, pumpkin pie, baklava and pistachio truffles. With a dizzying assortment of delectable goodies to sample, one might expect to pay a arm for this dining treat. Not so. The $7.50 a head buffet was not only priced economically, but the money collected was donated to hunger relief charity America’s Second Harvest. Good food, lots of it, and your money goes to a charity? What a deal! Marketers and ad execs are always looking for new and innovative ways to get their products in front of the public. From celebrity endorsements, to pairing your product with another, creating a synergy of awesome-ness, it’s amazing what is presented to the public. I submit, for your approval, one of the latest examples of American advertising synergy (?) NASCAR Meats. Yes, you read correctly, NASCAR is putting it’s logo and branding meat. Available at a grocery store near you, “Rev up your taste buds for the exciting taste of NASCAR Officially licensed meat products.” That quote was taken directly from the NASCAR Meat “Taste the Excitement” website. These NASCAR branded meat products include: hot dogs, bacon, sandwich meat and smoked sausage. So if you had a difficult time choosing your meat products before, NASCAR is here to help. Similar to Zillow, Real Estate ABC also offers some added features. The site allows users to adjust property values for a particular property. Adjustable property variables (values) include Interior, Exterior, Lot Size, View, Privacy/Noise and Local Market Conditions. You can also the local market conditions on a slider, from cold to hot and everything in between. It’ll be interesting to see the different offerings and features between Zillow and Real Estate ABC and if any other similar sites pop up. Aperol, now available in the U.S. I came across this post on Cool Hunting and was intrigued. I lived in Italy, Milan to be specific, for six months and really enjoyed my time there. While there, I developed an appreciation for gelato, quality Italian food and Italian coffee. I still love me some Breyers (Vanilla bean, please. It’s divine!) and Starbucks, but also appreciate all that is Italy. So whenever I come across something that will remind me of my time in Milan, I’m keen to try it. Aperol, a low-alcohol aperitif is a blend of 30 herbs, spices and fruits. According to Cool Hunting, it’s light and refreshing like the English Pimm’s, but has a more pronounced citrus taste. With an alcohol content of ! !%, it’s ideal for spring and summer cocktails, Aperol is best enjoyed mixed with soda, vodka or champagne. Tired of your bland manila file folders or even the bold primary colored ones you can get at your local office supply store? Longing for a bit of funk in your filing life? 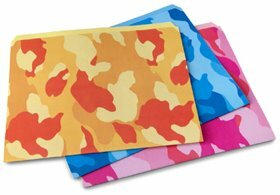 Bob’s Your Uncle, has your solutions: camo file folders! This Boston-based stationer has a flurry of this and other cool, off the wall, stationary products to bring some zing into your office. Available in blue, orange and pink, you can get a set of six (two of each color) for $12 at Fred Flare. Tired of running out of staples? 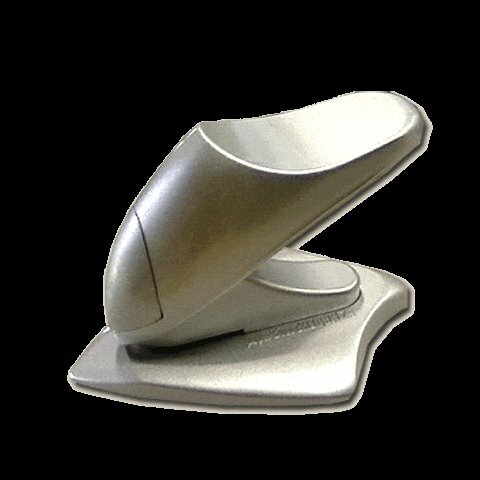 Looking for an alternative to your boring office stapler? Look no more, the Stitch Lock has arrived! The Stitch Lock uses the paper itself to hold the pages together, no more ugly staples! Popular in offices in Japan, the Stitch Lock can stitch together up to 7 pages. It’s certainly a novelty, but a somewhat useful and cool item. Available from Jbox.com for $36.